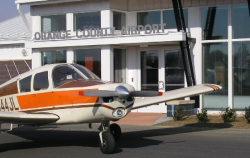 The Orange County Airport is a public use, general aviation airport operated under the supervision of the County's Public Works Department. It is located three (3) miles northeast of the Town of Orange on State Route 20. It has a 3,200 foot runway and will accommodate turboprop and propeller driven aircraft of 12,500 pounds or less. The airport is equipped with an Automated Weather Observation System (AWOS III) to provide pilots with real-time weather data to promote safe operations. The County owns 10 T-hangars and 19 tie-down spots to facilitate aircraft based at or visiting the airport. Tracey Corporation owns 18 T-hangars for lease to private citizens and businesses. Thirty-seven (37) aircraft are currently based at Orange Airport. The airport has a newly constructed Terminal Building with pilot’s lounge, restrooms, vending area, and conference room. The Airport Manager’s office is also located in this facility. High speed wireless internet connectivity through public access computer or personal lap top computers is available at no charge. Jet A and Avgas are available at the fuel farm located adjacent to the new Airport Terminal Building. Self service fueling is available at all times and fueling assistance is provided during normal business hours. The Airport is home to SkyDive Orange, a nationally renowned jump club. SDO operates from two (2) corporate hangars on the Airport property, used to conduct their operations and house their aircraft.